Some hasty (read: 20 minutes or so. My hasty isn't THAT fast) marker work. One of these days I'll learn to use the things properly. Anyway. Can't do much more on this since I've just packed my markers, so any further work will be in PITT pens or else pencils. Yay. Well well well (three holes in thr ground). Look, I managed to persuade myself writing diary entries was a GOOD idea. Actually, this is more of a "can I still remember how to use the friends function?" than a proper diary entry, since dialup is slowly killing me. (Although the fact I'm online less because of it has to be a good thing for my bank balance.) Anyway. Yes. Chasing favourites was all well and good when I was still on the Uni LAN, but being relegated to dialup means you have to start making sacrifices, you know...? Like, not having nineteen windows open at once all downloading pages from all over the web when you're only on 35.8Kbps because you've hit rush-hour and BT is at a crawl. And like not wasting money waiting for a page to open only to find out the PC is playing about with network settings and doesn't want to load it at all really. 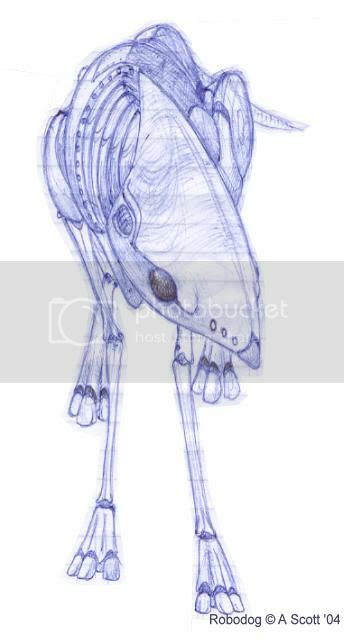 Speaking of creature design (yes, I'm not rambling about "friends" lists any more) I've been doing some more work on the Kiravai in my spare time (well, mostly when I was skiving in the library, so they're mostly biro sketches. If I can clean them up and get rid of the lines on the page I'll upload them). Some pics, though... links go off to DevART. Shalyavei dignitary. She's a character in a story I'm sort of halfheartedly working on - called "Displaced", if you look hard enough online you'll find out what it's about; it's a crossover between series, anyway. She's only on the scene because she's needed by the "good guys" - I mean, if you want to out-tech a Kiravai, you need a Kiravai to do it. I'm actually quite looking forwards to colouring this one - lately I've been getting really lazy with my art, and if it's not done in black biro (which I usually manage to at least ATTEMPT to shade) I get bored before I finish it. I have some more things I'm planning on working on, but as yet no inclination to do so - Kiravai military, and some weaponry designs. It's hard describing a weapon in a story if you yourself don't have a clear idea what it looks like. :P I need to design a plasma-percussion rifle, at very least, since that's sorta pivotal to "Displacement." Edit: It usually helps to actually link to where you want links to go, doesn't it? I KEEP forgetting to upload these things. WAAY back in the mists of time (aka a few weeks ago) I was on a week-long training course, with all my fellow pre-regs from the eastern region, and naturally not a HUGE lot of work got done in between listening to the tutors ramble on, and drawing so my brain didn't go to sleep. :P (Seriously, if I don't at least scribble in the margins, my brain is lulled by the drone of voices and goes to sleep, and then I follow suit. It's embarassing.) And finally I remember to upload them. Yay. This is just a "collage" of a sort of all the randome drawings that spouted forth from my pen. 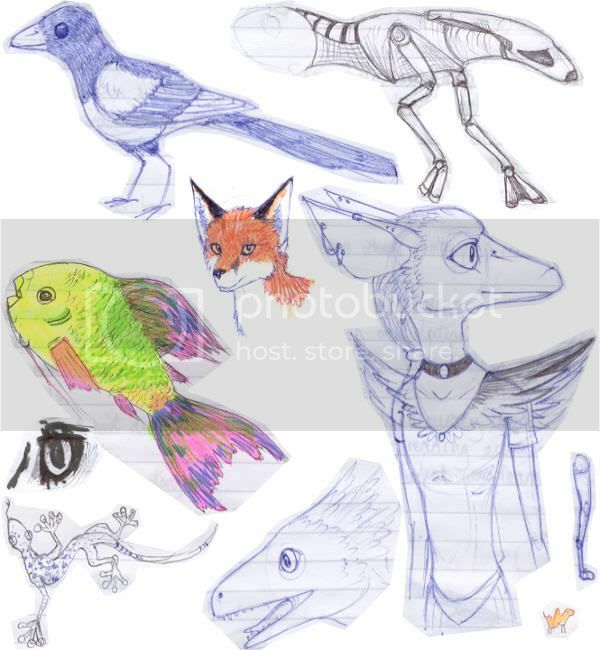 The Kiravai on the bottom right is Magpie (or just "Mags"), Dauntless' computer's personification, and that's a sort-of robot dog in the corner above her. The real magpie started out as a markings-plan but then the one I was watching flew off, so I gave up. Since "Emily Manning" was my newest character, at that point, naturally I wanted to work some more on her. So here she is. The one in the bottom left is the most-correct portrait, since on the one on the right (the first effort) the ear is too big and the eye too small. Blagh. The rest of the ears are experimental - trying to get a "saluki-esque" ear without it being floppy. Well, I managed to cobble my halfway-presentable Kiravai doodlings onto one page, so here they are. 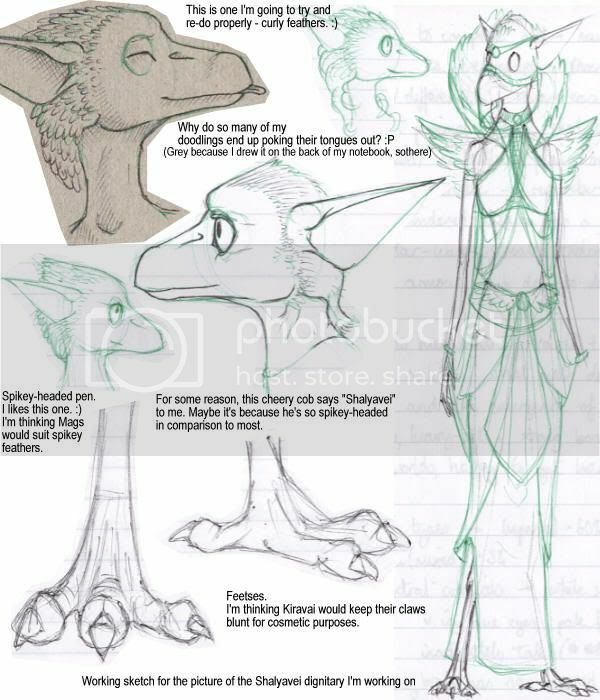 I'm still not sure if I like the eyes, though - I wanted them to be slightly rounder and "birdier" but not TOO un-human, and I'm not sure if I like these better than the old style.